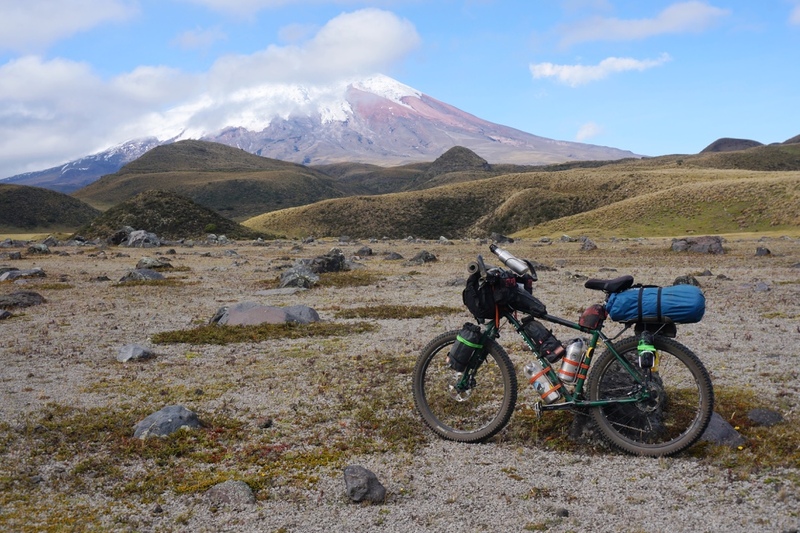 The bikepacking.com‘s Los Tres Volcanes route goes around Cotopaxi, Quilotoa, and Chimborazo. It’s not really part of their TEMBR route (Trans Ecuador Mountain Bike Route), but it can be woven into the middle of it for an epic ride (and hike-a-bike) through some amazing volcanic landscapes. After our major hike-a-bike up Yanaurca de Piñan on the TEMBR singletrack route, Neon decided to strip his bike down to the bare minimum for our ride on the Los Tres Volcanes route. It turns out that the local Ecuadorian postal service “Correos del Ecuador” has a service similar to our post office “general delivery” in the U.S., where they’ll hold packages for up to 30 days time*, so we shipped a rather sizable box south to Cuenca for only ~$6. We left Tumbaco on the TEMBR dirt road version, following a series of mostly cobblestone roads to Pintag where we hooked up with the Bikepacking.com Los Tres Volcanes route. We gained a dirt road shortly out of Pintag, then cobblestone roads for most of the afternoon. The ride from Pintag to Cotopaxi was mostly on cobblestone roads, but not your average cobblestone roads—these were soul sucking, bone shattering, energy sucking cobblestones—until we turned onto a smaller road with time polished little river rock cobbles. The smoother surface slowly lifted my mood, and my energy. I was pretty happy to come across this mini forest of Polylepis as we rode toward Cotopaxi. Polylepis is thought to be the highest flowering tree in the world. They only grow at mid to high elevations in the tropical Andes, and there aren’t many large stands of them left. After a few more kilometers we turned onto a sandy dirt road. It was heaven, fast, smooth, sinuous dirt. Cotopaxi started to show itself through the cloud layer. Our moods shifted. The terrain was perfect for camping, empty and wild, with panoramic vistas. We rode a few more kilometers, along the outskirts of Cotopaxi National Park (riding on the singletrack route for a short bit to avoid going to Tambopaxi Lodge), until we had the perfect view of the mountain, before pitching our tent. The sky was full of stars when I woke to pee in the night. My eyes immediately focused on Pleiades (my favorite constellation), then Cassiopeia. Cotopaxi was perfectly clear, like a giant on the horizon. I stood there just staring in awe, until I was too cold and began to shiver uncontrollably, before returning to my cozy quilt. We woke to puffy clouds and blue skies. The air was crisp, near freezing, but the sun was shining, and considering we were at 3,710 meters (12,172 ft) it felt surprisingly pleasant (for how cold it was). The sun here is so intense that even on chilly crisp freezing mornings it can feel quite nice out, but when the sun dips behind a cloud, it feels instantly freezing. It had me unzipping my jacket to try to keep from sweating, then rezipping five minutes later (when it went behind a cloud) to keep from freezing. We followed good dirt roads for most of the day. The views from the bike were otherworldly, large and small boulders dotted the landscape, small hills/mounds rose from the flat, and Cotopaxi stood tall like a god surveying its lands. When we stopped to eat I could see that what I thought was just a carpet of grass covering the surface, was actually a variety of different plants: mosses, lichens, ferns, lycopodium, flowers, and so much more. Shortly after lunch we came upon a locked gate, the first of many we’d encounter on our way to Lasso. Thankfully we’d had a lot of practice getting our bikes up, over, and under locked gates during our time in Mexico, so we were able do these fairly efficiently. After hauling our bikes over the gate, we dropped into a big wide valley and followed nice double track along the Rio Tamboyacu. I’m not sure what these shallow pits were, but they reminded me of the tomb sites at Tierra Dentro in Colombia. We passed several signs, after the locked gate, that suggested the area is a preserve of the local paramo. But obviously the road still sees a lot of traffic. The roads were so nice that we rode several kilometers past one of our turns before realizing it. We backtracked to where we left our route, to find another locked gate. This one was a little tricker to get the bikes around. The gate was quite tall, so we opted to take our bikes over the berm fence* beside the gate, but that was also difficult because there was a three foot deep ditch fence on either side of the gate as well. [* a lot of fences in rural Ecuador are earthen fences, where a deep ditch is dug around an area, and often in combination with a berm (utilizing the dirt that came out of the ditch). We made it across the gate and fence to an old, mostly unused, two-track road that eventually deteriorated into meandering cow paths. After a short while we came to another gate, thankfully this one was unlocked, but the cow on the other side gave us that look like he’d never seen the likes of anything like us before. Shortly after that we came to another gate, also unlocked. We trudged through ten inch deep sticky mud, for thirty feet, before reaching dry ground. Several dogs came running out, barking, snarling, and growling. Usually I find this annoying, but we had just entered someone’s private homestead through a closed gate–so I looked at them and said ” I know, I know, but this is where our track went. Surely you’ve seen the likes of us before”? They sniffed my ankles, growling a little under their breath (and making me a little nervous), but eventually they wandered off, in the direction we were heading. We passed a couple of buildings, then came to another gate where several men were working. It always amazes me here how no one seems alarmed by our presence. They do very often look at us as though we’re very strange and foreign, but not like “hey, what are you doing on my land”. Instead they smile and welcome us, ask us where we’re heading and give us directions. Looking back on the homestead. After looking at our map, I realized where we had missed our turn and then backtracked to the locked gate with the earthen fence, we could have just continued down the nice road and it would have taken us around to the same place to cross the Rio Tambo, without having gone through the homestead. But then we would have missed this great interaction, which now, looking back, holds a very strong memory for me. When we reached the tiny village of Tambo there were three gates to choose from, and our track made little circles on the map. We finally decided on one of the gates, but just in case, Neon also hailed directions from a local that was nearby. The local asked where we were heading, to which we replied “Mulaló” (a small town near the Panamerican highway). He pointed us in the right direction, adding “just follow the green”. The tiny settlement of Tambo. Neon, getting directions from the local. Horse corrals in the tiny settlement of Tambo. Quilindaña rising above the ridge. We continued on, following the green, for a few more kilometers before stopping to camp near a hand-dug mini-canal. Near sunset the clouds cleared just enough for us to get a glimpse of Antisana. The views on this route have been incredible. The next morning we continued on “the green”, until our route dropped down to the Rio Tambo, and then for what seemed like an unnecessary hike-a-bike along the Rio Tambo, only to climb back up a “carry your bike” style hike-a-bike back to the green. My advice to future riders here is to just follow the green and don’t drop down to the Rio Tambo after the small settlement of Tambo. Snack break on the soggy paramo. By midday we started climbing up to the pass. It was hard work, but there was the promise of a road on the other side. It’s steeper than it looks! We encountered a lot of deep mud on the “trail” from the pass to where a road began to emerge. It never looked very deep, maybe an inch or two, but my rear tire was repeatedly sucked into a muddy void all the way past the brake caliper. When we finally reached drier, less muddy, ground I gave my brakes a good hosing off with my bike bottle. Shortly after we finally reached more of a road. It was highly eroded in places, but completely ridable for two wheels. On the way down we encountered several more locked gates (four of them after the pass if I’m remembering correctly). It rained the whole day, raining harder as we went down in elevation, so this locked gate (above) was the last photo I took. From this gate the route goes on through logging land, passing through several more locked gates before dropping down into a narrow river valley for one last steep uphill, followed by a sweet descent into Mulaló, and then a short ride on dirt into Lasso. It’s pretty special to get to be in these places. I don’t always remember that at the time. Sometimes, in the moment, it feels like pure bliss, and other times I’m like “why does the route go this way”, or this would be nice “if only …”, but looking back I realize it was all magic and I wouldn’t change a single thing. I keep trying to remind myself of that as I continue forward on this journey, to just be present, and that the magic is there if I’m open to it. Pleiades is my favorite too! I love looking at it through binoculars; alone it would be worth buying a telescope or a spotting scope. As usual,,, wow, you guys are tough. You are in a never-ending place of astonishing mountain views, and gates that beg to be passed. I hope you got to Cuenca on time.